A new flare-up of violence in the last rebel-held city in Eastern Ghouta has served as an opportunity for the US State Department to claim chemical weapons were being used. The allegations were quickly endorsed by the White Helmets, a Syrian medical NGO active in a number of rebel territories. The White Helmets are often making allegations of war crimes in Syria. Images of dead bodies are common enough too after such strikes, but combining them with a story that everyone suffocated on some exotic gas makes it a much bigger story. It also is in keeping with the State Department’s interest in boosting international calls for regime change. Evidence has been lacking in claims of chemical attacks by Syria’s government, and proof has been non-existent. US officials, however, never let uncertainty get in the way of a good story, and will not only be repeating this claim as unquestioned fact for years to come, but as seen last year, may use it as a pretext for a military strike on Syrian forces. We shall know them by their fruits. Think about it; Who else has the power and ability to bring us such timely propaganda? Not with the Internet here. Trump will just make right-wing people look pro-war again, as under “Conservative” Dubya. If Trump attacks Syria, the Dems likely win in 2018, and he gets impeached. You can’t run a campaign against stupid wars and then jump into one using a casus belli like this, especially after Mattis’s recent comments and Trump’s desire to exit Syria. It’s just beyond stupid. Plus, his core of supporters are anti-war. We care about domestic matters more, but I think most understand a new war is political suicide. i live in the deep South, and can tell you that the core of his supporters i see most definitely are not anti-war. typical bumper sticker of a truck parked by my work every day: ISIS Hunting Team – Infidel Division, or, I’m The Infidel Allah Warned You About, with tons of red, white, and blue BS surrounding it. Hunting ISIS is very different from attacking Assad. They are on two different sides. If Assad is removed, ISIS, al Qaeda, or a similar group comes to power. Trump ran on “defeat ISIS and leave”. I also live in the South. I just know the online supporters who supported Trump. When talking in person with people locally, the interest was mostly immigration and trade. But voters have limited political education in general, all voting groups. Republicans might like Trump since he defeated Hillary, but his core of supporters didn’t like war and wasteful military spending. It doesn’t fit with the populist position. America is broke. Trump did not run as a tax cut and war Republican. Trump promised not to cut social security, spoke fuzzily on universal healthcare. Trump was the welfare and high paying jobs Republican. Democrats assume all Republicans are “tax cut and war” Republicans, but that’s just not true. Just to make an addition, Christians in the MidEast side with Assad. And Trump promised not to forget MidEast Christians. That was an early promise. EDIT: Apparently Trump is not now attacking. Kind of lame to drop a chemical false flag now, but not beyond the Coalition. A Russian or Syrian airstrike may have hit an arms factory or dump with chemicals, which is also likely. The SAA has found and reported DAESH Ghouta chemical weapons lab that was since documented and reported to the UNSC. However, if the DAESH make some of their own explosives and meth-type drugs, which they have also been known to do, that might also explain the presence of dangerous chemicals and sickening of the population. Geez – I wonder if it was the same Russian agents that poisoned the ex-spy in the UK who are now causing havoc in Syria – busy little beavers, aren’t they? I imagine that they are carrying knapsacks full of deadly nerve gas, and they are wearing radio headsets so as to stay in constant contact with Putin. Syria and Russia already knew about the false flag attack. Russia MoD predicted the one that just occurred one month ago claiming it had all the intelligence including how the weapon would be delivered. ISIS has no problem killing children as it already has beheaded them by the thousands and has been caught in other false flag chemical attacks. Why are Americans so stupid as to fall for this when the truth is right in front of them? Their busy working four jobs in order to pay the rent. …and their taxes for the wars. “Know very well what they are doing”- well, not Trump. He takes these things in hook, line, and sinker. Most people spend their time working. They don’t understand these matters. The media shapes reality for us. Does being busy at work absolve us of our complicity? Did you see Moon Of Alabama reporting that the Douma resistance pulled their negotiators out of talks with the Russians- and executed them? Yes, it was mentioned also in Al-Masdar news outfit from Lebanon. There is a desparate effort going on by Western countries to preseve at least few blocks in Douma where terrorists can remain holed up. The harrowing stories by liberated civilians of their ordeal under the headchoppeds rule — is of no interest to the Trotskyite West. They are like their idol, a collection of zealots, determined to “win”, a definition of which is less then meets the eye. For as long as they can hang around the power centers, contrkl and direct them, they are satisfied. Time and again, they brought disasters to US interests through insane foreign policy, yet they are still shaping policy. Foreign policy. US has no longer any domestic policy, other then as a fallout of foreign policy. President’s decisions are contradicted and ridiculed. No matter what the voting public wanted out of foreign policy — is if no interests to zealots. And Russia that defeated Trotskyism, is now its biggest enemy globally — is to be tackled by any underhand means possible. But the restraint that comes out of fearing Russia, is making them more crazy and reckless. As the wise one said, if nothing changes, nothing changes. And if we continue being charmed by the snake oil sakesmen and women from democratic party, and theit enablers in Republican establisbment — the same Tritskyites wll tighten the rope even further. Now, they are after anybody in the public information arena, to detect the “sentiment”. So now, a witchhunt is about to be let loose. Moon of Alabama is orobably at the top of any list. Israel shoots 25 unarmed protestors and the USA has no comment, here an attack by known terrorists is claimed and immediately the USA condemns Russia and Syria. What’s wrong with this narrative? And what about all the slaughtered people in Yemen by Trump and his Hitler friend in Saudi Arabia. Not a peep from the international community. This latest false flag is an absolute orchestrated campaigned by the MIC. Yup. that didn’t last long. Big idiot he is. Now he says Obama should have taken out Assad. When the war starts will JR admit he was wrong and we were right? And nary a tweet about the IDF shooting fish in a barrel in Gaza. Nope. It was around 1,000 that were shot. 20 plus were the number shot dead. The numbers reported were 30,000 protesters. 1,000 shot is a VERY high percentage. It may be the IDF snipers began by shooting at the rear of the protesters. If that is the case, the goal was to rack up the largest number possible. A horrible crime that will likely be ignored by the MSM. Anyone who does not know that this is another false flag event has been living under a rock. The deep state, the Israeli controlled media,the war profiteers, Saudi Arabia, and Israel want war with Iran and are willing to fight it until the last American drop of blood and the last American dollar. Trump has fallen into the swamp. He been drawn into this mess when his instincts all along have been to get out of these wars. With Trump falling into the swamp and the Congress a bunch of quislings who dance to every tune Israel plays, hope is fading fast. Given the cast of characters involved, there never was any hope. I really did have some hope during the Trump candidacy. Then again I had hope with Obama who rally blew it since he came to office with the support and good will of almost the entire world. But that Washington swamp is deep and dark and there a few people brave enough to challenge it. I didn’t vote for Obama (did not vote McCain either), but I at least hoped Obama’d better on trade and foreign policy. And I hoped the GOP could hold him off on immigration, which they did somewhat. Russia unlike the United States has got rid of all its chemical weapons. I know you’re joking, but he wouldn’t do that unless WWIII had started. Then we’d likely see total war, albeit maybe not nuclear war at first. Assad should just take credit for the attack and claim self defense. It should work since shooting unarmed protesters in Gaza has already been established as self defense. We certainly would never be hypocritical about these types of things. I don’t know whether it was a gas attack or not, but let’s assume that it was. Why would the Regime use poison gas? Maybe they got spooked by Trump’s talk of pulling out. But why would that bother them? One would think that Assad would want the USA to pull out, but let’s rethink that. What would happen if the USA pulled out. Our presence isn’t really hurting the regime right now. They are already winning the war against the “rebels”. Other actors opposed to the Syrian regime would move in or become more aggressive in the absence of the USA. Particularly the Turks. And Israel would have a freer hand to go after the Regime and its partners. There is no conceivable scenario in which the Syrians would want the Americans in Syria. None. There is also no conceivable scenario in which this attack makes any sense. Hell, if you are going to actually use chemical weapons militarily, you don’t drop the weapon and then sit back and do nothing. You drop it and then send in the attack. With troops equipped to operate in the presence of gas. Where are the troops? Where’s the attack? I like your willingness to think outside the box. However, I doubt Assad even has chemical weapons to use, and I doubt he would use them here. That is exactly what the US is trying to prevent them from doing. The mainstream media is eating this story up here in the United States of Amnesia. Don’t the sheeple who watch that stuff have any memory of how bogus these supposed Syrian chemical weapons attacks have turned out to be? Don’t they realize that every f-ing war we are fighting has been the product of some false-flag BS like this? Put your phones down and wake up, folks! Now Trump is the more-aggressive-than-Obama President? Disaster. The White Helmets are not medical NGOs — they are murderers and propagandists. Any medical assistance they render is to push America into war with Syria and Russia. State Department has joined Chemical Boris in throwing around accusations, facts and commin sense be damned. Whenever a bunch of head choppers get conered in their last hudeouts, you can count on the collective West to have a fit, and accuse Russia of using chemical weapons! This time, as thousands more evacuated were making their way out of the pocket, the terrorists started shooting. What happened next is not hard to imagine — a lots of dead civilians. So, who do we blame? Russians, of course. UN, under the influence of the West has NEVER distributed aid of any kind to population, UNLESS the population was within terrorist held areas. As Syrian relief was not allowed in, UN supplies were a cover for providing terrorists with supplies to fught longer. But the moment civilians were liberated — no more assistance to them. UN aid is known to be tampered with, including the transportation of weapons. Many times were caught. 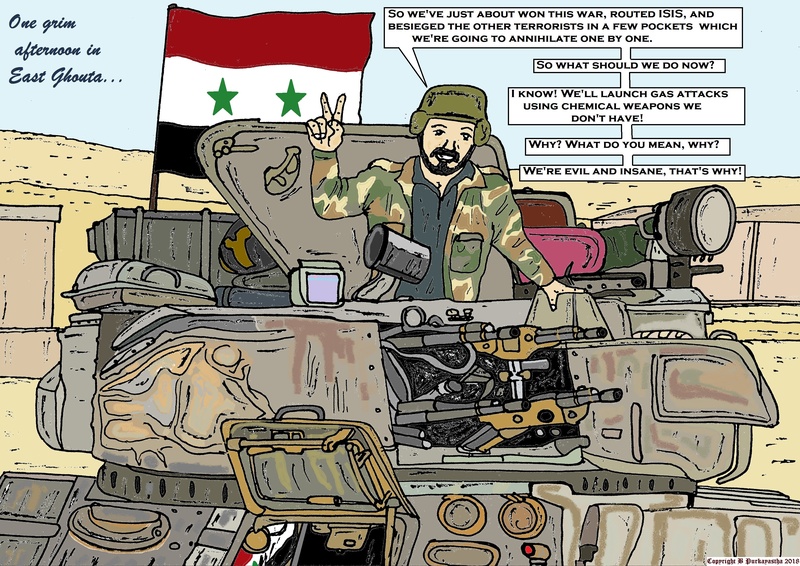 In Syria, liberated Syrians do not get Western aid. Thise millions that already returned to Syria, are getting aid from Russia, China, Turkey and many Asian states. But US actually frowns in such aid. When small Serbia gave aid in blankets to population if liberated Aleppo, it was reprimanded fir helping “Assad”. This is classic Trotskyite ideology. Everything, absolutely everything is subjugated to ideology. Even the very definition of humanity is subject to their objective. Today, as many Eastern Ortidox Christians in Syria are celebrating Easter, and the festivities are supported by their Moslem friends and neighbors, their very existence is at the expense of many young Syrian soldiers. Yet, the ordeal of many Christian towns and villages, while abundantly documented — is never mentioned in Western press, or by ANY Western government. Ideology is all that matters to a Trotskyites. They must win. They are trying to avenge the defeat of their hero at the hands of Stalin. The lives of others, Americans included, are to be sacrificed at the altar of their zealotism. These “chemical weapons attacks” are so transparently false flags. The powers that be clearly have nothing but contempt for peoples’ intelligence. Trump wanted an excuse not to reduce US troops levels in Syria, now he has one. There will be a US military base surrounded by concrete walls labeled an embassy before Trump orders the withdrawal of US troops there. US foreign policy for the Middle East is intended to keep the countries there weak. No matter how poorly crafted the lie, Donald the toad eating lick spittle will do the will of his God-king, “Bibi the Omnipotent”.